The browser back arrow of death - Terraine, Inc. They don’t really understand how Google works. To them, it’s like magic: enter a few words into a blank text field, and voilà! Out pops a list of sites that have exactly what they were looking for. “Wow! How does it know that that was what I was looking for?” they ask themselves. They think that if they build a website, that that’s all they need to do. They are done. End of story. Because—of course—if they build a website, visitors will just magically arrive on their site and will of course buy whatever it is they are offering to sell them. 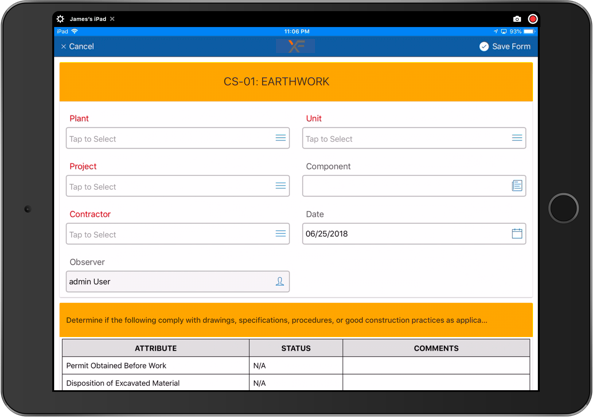 The above two topics are related and matter greatly if you want to be found online. I call this “discoverability”, defined as the ability for a website to be discovered by total strangers. Let’s start with the first concept, which is how Google search works. Note that the following pertains to organic search, not paid search. To simplify how Google works, think of me—your narrator in this article—as the human Google. You ask me a question, and I answer with a list of site links that I think you are looking for. Take a look at the screenshot below and think about how this would go if you asked another human verbally. 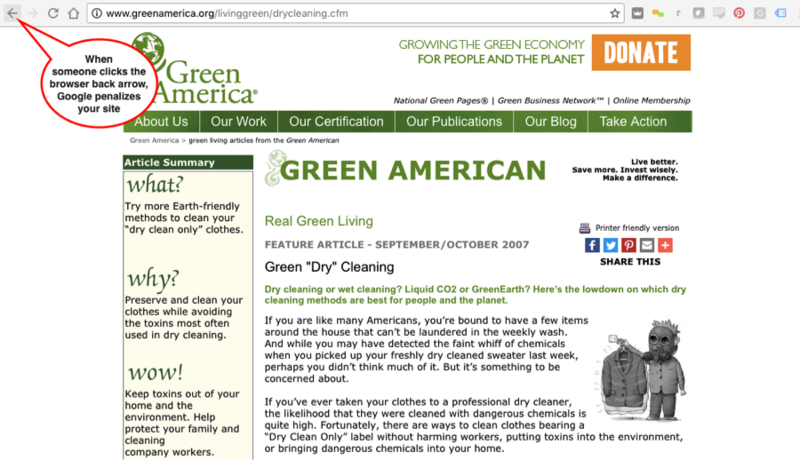 You: You click on the first organic (non-ad) link, which is greenamerica.org. 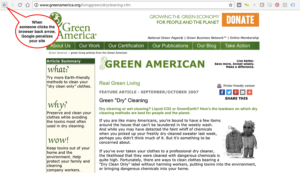 You look around for 2 seconds, and then click the back arrow of your browser to go back to the search results to see if there is something more relevant there that you can click on, because greenamerica.org was not relevant to what you wanted to find info about. 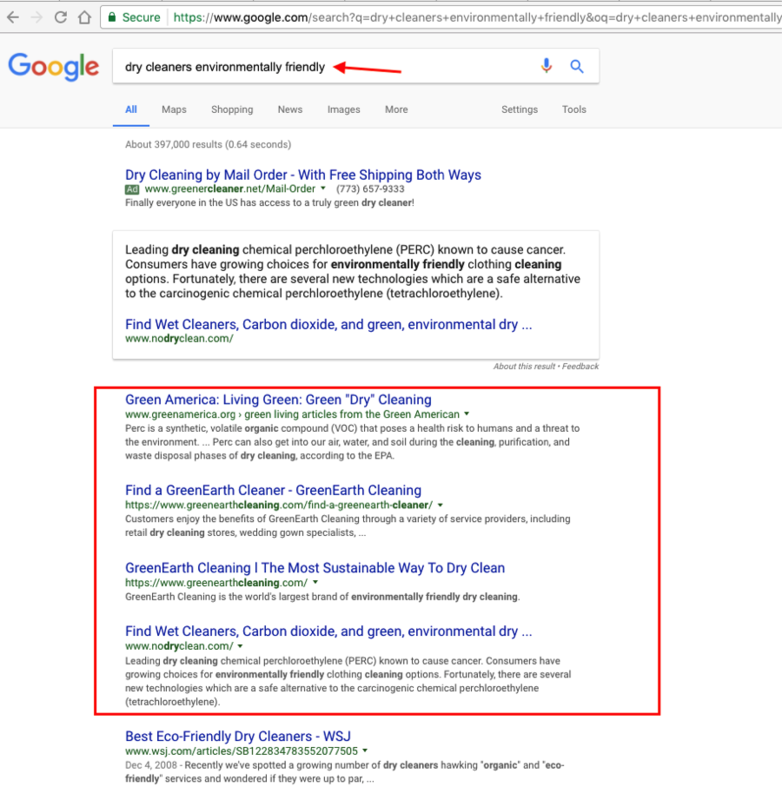 You: Now you are back on the search results page, and you click on the fourth organic result, which is nodryclean.com. You look around for 2 seconds, then click on a link inside that page, navigate somewhere else on their website, read some more, and then get bored and open your Facebook page. And you don’t click the back arrow. When you click on the back arrow of your browser, Google treats this as a negative experience and uses that information to move the site you just visited down in the search results pages. When you don’t click on the back arrow, or if enough time has passed before you click on the back arrow, Google treats this as a positive experience and uses that information to move the site you just visited up in the search results pages. Obviously there’s more to it than this, and the process that Google uses to move sites up or down on the search results page takes time and involves a lot of variables. But the main point is that you need to create content that provides something of value to real humans, so that they stay on your site and don’t click on the back arrow. 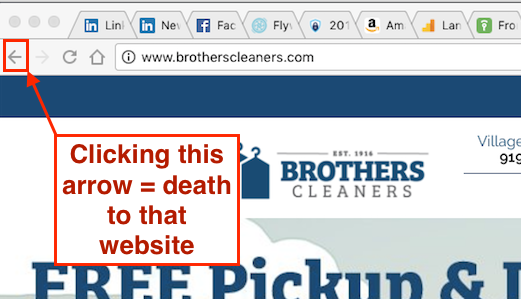 Because if they click the back arrow, it’s like death to your website: Google will remember this and demote your site, and your site will never make it even close to page 1 of the search results page. And if you are not on either page 1 or 2 of Google’s search results page, how likely will someone find your site, if lets say you are on page 10? Don’t kid yourself. Never. A lot people think that once they build their website, they are done with online marketing stuff and that leads will just appear, like magic. Well, it doesn’t work that way. You have to get them there. They aren’t going to just magically find you online. Maybe your current customers will find you online, and maybe your mommy will too, but so what? They already know you. What you need to focus on is being discovered online by total strangers. And these strangers need to find you by searching for terms and phrases that match your industry, expertise, or whatever it is that you are trying to sell. Let’s use an example: Lets say you own a dry cleaners called Dry Cleaners R Us in Wilmington NC. Your website is drycleanersrus.com. How likely is a total stranger (that doesn’t even know your business exists) going to enter “dry cleaners r us” into the Google search bar? Not a chance. But how likely will a total stranger enter “dry cleaners wilmington” into the search bar? Highly likely. 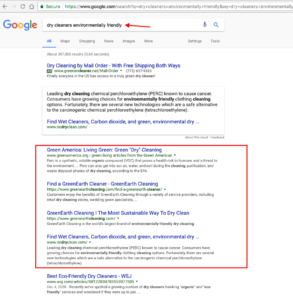 So your objective is to show up on page 1 of Google’s search results page for the search phrase “dry cleaners wilmington” and similar phrases. And to get on page 1, you have to have enough high quality content for Google to notice and put you there. Remember the first concept we discussed earlier in this article? Yep, this is where it fits with your website strategy. You have to create a lot of high quality content in order to rank organically, which means going beyond just building a few static pages that never change. It means creating helpful articles that solve your potential customers’ (i.e., total strangers) questions and problems. Typically this is done via blog articles, but it doesn’t have to be. It can be other types of content: photos, video, etc. Point is: don’t just create a brochure website. That won’t get you very far nowadays. If you merely create a basic website with 4 or 5 pages and just stop there, it won’t drive any meaningful organic leads to you. Yes, creating content is painful, but the long-term effects of organic search far outstrips paid search, pays dividends for a very long time, and doesn’t stop producing the minute you stop putting coins in the AdWords meter. It doesn’t happen overnight or by magic. It takes real effort to come up with content, but it’s well worth the wait if you put the time in, are diligent, and—most importantly—patient. Why Do Employers Block Access To Popular Websites? Just starting your startup? Learn to dodge the whack-a-mole mallet.